For more than 40 years, IBM® mainframes have supported an extraordinary portion of the world’s computing work, providing centralized corporate databases and mission-critical enterprise-wide applications. The IBM System z®, the latest generation of the IBM distinguished family of mainframe systems, has come a long way from its IBM System/360 heritage. Likewise, its IBM z/OS® operating system is far superior to its predecessors in providing, among many other capabilities, world-class and state-of-the-art support for the TCP/IP Internet protocol suite. 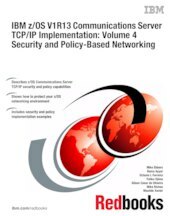 This IBM Redbooks® publication explains how to set up security for the z/OS networking environment. Network security requirements have become more stringent and complex. Because many transactions come from unknown users and untrusted networks, careful attention must be given to host and user authentication, data privacy, data origin authentication, and data integrity. We also include helpful tutorial information in the appendixes of this book because security technologies can be quite complex.